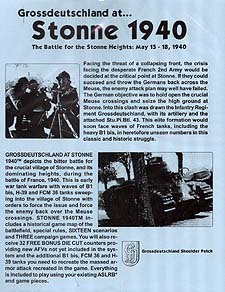 Stonne Village, France, 15 May 1940: The commander of IV Battalion, Major Schneider led a reconnaissance party into the village of Stonne. On they way all that could be seen were abandoned houses, ruins and overgrown gardens. They were well aware of the high water tower that commanded the entire village. Moving forward, Schneider and his men passed a knocked out German panzer, tipped over in a ditch. Suddenly, rifle fire cracked from the direction of the tower. With the decisive hill only a few meters away, the party came under machine-gun fire from the edge of the woods. As Schneider's party grew with the addition of stragglers, thirty Frenchmen soon appeared, deployed for the attack. As the party headed back toward friendly lines through the gardens, several French tanks were seen heading for another part of the village. Artillery soon began to land in the village and the French tanks, earlier seen heading for parts unknown, turned their attention on Schneider and his men. This is not a complete game. Ownership of Croix de Guerre and Beyond Valor are required to use this product.